You know how a bridge will be useless if it breaks in the middle? Your rod will be even more useless without the right fishing line. In fact, it is the line that is the medium of connection between you and your future meal. If the line snaps while you try to bring in your fish, or worse, snap even before the fight begins, it will be a walk of shame home. And, fishes do put up a good fight. So, if you solemnly wish to land a few fishes, even big ones, you have to get the right fishing line to do it. It is not the easiest task, however, to choose the right fishing line for your purpose. You not only have many features of the line itself to consider but also a lot of your own requirements. Furthermore, if you are fishing in saltwater you have a few more things to consider. However, all of these are not that hard as at least you don’t have to sit and make the line yourself. In order to find the best monofilament fishing line for saltwater, you have to first know how to find it. Our buying guide will tell you how. If that does not enlighten you enough, we have also added the reviews of 10 best monofilament fishing line for saltwater. The greatest disadvantage of a monofilament line is its tendency to sink into the spool. And, here is a line that tells you and makes sure that doesn’t happen. In fact, the Kastking monofilament line has a unique design of paralleled roll track. This is the feature that keeps it from sinking into the spool. Furthermore, it helps the line occupy less spool space. You will get everything you expect from a monofilament line from this particular line. Apparently, it is quite soft and supple with a superior nylon as its material. Therefore, tying knots will never be a problem for you again. Furthermore, this line is very smooth and will not get tangled when you cast it. Not to mention, it is super easy to cast as well. Since you are looking for a line suitable for saltwater, you will be happy to know that this line is abrasion-resistant. So, just use it like you would use a line in freshwater but ye, it is best if you rub off the salt after each use. Although most people are extremely happy with this line’s performance, a few found it to be too stiff. According to these few people, this line was not easy to spool and also got curled when cast. But, such occurrences are few but it would be better if you checked the quality of your line first somehow. ​​Does not sink in the spool. ​​Soft, supple and smooth for tying knots and long casts. ​​​It may seem too stiff. ​​​Might be hard to spool. ​​​In a few cases, the line curled when it was cast even though it was not supposed to. Stren is one of the leading manufacturers of monofilament lines and you can expect nothing less than the best from their lines. You should check the High Impact line out if you have big and heavy fishes in mind as targets, specifically from 10 to 30 lbs. Apparently, whichever weight you choose, this line assures you of a great winning battle against the fish. Living up to its name, this line is incredible at absorbing shocks. Therefore, it does not matter how aggressive your fish is, your line won’t be harmed. With so much shock absorbance, you can definitely expect more durability from this line. If shocks cannot harm it, how will anything else? Moreover, you do not have to worry about its ability to handle saltwater either. It is quite good for saltwater as well. While most customers loved the feel and strength of this line, a few complained about its casts. According to them, the line gets tangled when cast and is also difficult to wind. A few complained about it breaking as well. ​​​The brand is renowned for making monofilament lines. ​​​Capable of absorbing a lot of shocks. ​​​Available in a number of appropriate colors. ​​​​Provides a smooth and good feel. ​​A few customers complained that it gets tangled easily when cast. ​​​​It is a bit hard to wind around the spool. ​​​​Might break easily as well. If you have really big species in mind then no other line will serve you as good as this one. You already know of KastKing's reputation since our top pick belonged to it as well. What you will be amazed to find about this line is that it will offer you the highest range of tests you can choose from. Apparently, if you want to deal with 100 lbs fish, take this line with you! Furthermore, it is everything you expect a monofilament line to be and much more! In fact, it cuts through water super fast and that too silently. You fish won’t have a clue for a while what’s happening. Even if it does and starts up a fight, it’s a losing battle for it. Because this line is shock absorbent as well. It also takes up less spool memory. You do not have to worry about breaks in the knots either because it’s super easy to tie and stays put. Apart from that, it does not stretch much so you will get great sensibility from it. You can use it in saltwater as it is abrasion resistant and also wear resistant. ​​​Cuts through water super fast. ​​​​Shock-resistant and fights big species well. ​​​​Does not stretch so has good sensibility. ​​​​​Easy to cast and tie knots in. ​​​According to a few customers, it broke way too easily. ​​​​Might be a bit too stiff. This is another line that will score high in your list if you want more tensile strength. Whether you want to deal with 4 lb fishes or 80 lb ones, you can choose from quite a good range of tests when buying this line with the highest test being 80 lbs. Moreover, the line is quite durable as it is very shock absorbent. It does not just let you carry the weight of an 80 lbs fish but lets you fight its resistance well. Anything string on the way can't damage it easily thanks to its absorbing power. Furthermore, you can feel even the slightest touch as it has great sensibility. In fact, you will rarely find a monofilament line with much less stretch. As it is made from superior quality nylon, you can expect it to be soft and smooth. Tying a knot should not be difficult but there are a few rare cases in which customers found it difficult to do. Apart from that, the line is quite durable and stays strong even at the knot points. But, since it does not have a lot of stretches, it is rather stiff and can be prone to breaking under too much pressure. You will be able to cast it very easily, however, and it is suitable for saltwater as well. ​​​​Shock absorbing power helps deal with fighting fishes well. ​​​​Less stretch makes it highly sensitive. ​​​​​Easy to cast long and thin enough to cover quite a distance. ​​​​​​Abrasion resistant and suitable for saltwater. ​​​​Tying a knot may be difficult. ​​​​​Might break easily as it is quite stiff. If you want the ease rather than heavy catches, this is the perfect line for you. The first thing you should know is that this line has a range of test only up to 30 lbs. Now, you might consider it a negative if you were willing to catch heavier species. However, keeping the range low allows this line to satisfy you better in all other aspects. Firstly, let us consider the ease of casting. Apparently, this line has a thinner diameter accompanying its lower tests. As a result, you not only get to cast far but also cast fast. Furthermore, there will never be any issues with line memory. This line gives you a smooth and soft feel. You can use it without worries in saltwater as well because it’s abrasion-resistant. Although the brand claims that there will be no changes in the strength when a knot is tied, a few customers complained that a knot decreased the strength. However, you can expect very easy winding with this line. ​​​​​Thinner diameters improve casting and sensibility. ​​​​​Long casts are easier and smoother. ​​​​​Knots might decrease the strength. If adventure and uncertainty are in your blood, you need a line that is strong enough to handle it all. Apparently, the Hurricane monofilament line is something you can seriously consider for your adventurous trips. You can use it almost anywhere as it is abrasion-resistant. So, if saltwater worried you, do not worry because it cannot just take on saltwater but strong bites as well. One more thing that will amaze you about this line is its small diameter. While it has a transparent-ish color, fishes still notice other lines with the same color. However, its extra thin body gives the fishes no clue that they are in grave danger. Being made from the best quality materials, it will provide you with the durability and strength you need. Moreover, making knots in it is easy and the knot strength is also mention-ably high. Due to its high knot strength, you do not have to worry about snaps either. However, it does have some memory and that makes somewhat susceptible to tangles. ​​​​​​Thin diameter makes it almost invisible for fishes to track. ​​​​​​High knot strength makes it stronger. ​​​​​​​Bears a bit of memory that increases the chances of tangles. ​​​​​​​Might not be very hard. As if hunting down fish was not enough, you have to deal with the debris that comes up when you are fishing as well. Luckily, someone took that difficulty into consideration and made the Monster Blade line. How does it contribute? Well, this line has low ductility and also stretch which reduces the unnecessary vibrations and also resists debris. Therefore, you get some relief from those painful cleanup tasks. However, that’s not the only feature that should bring your interest in this line. The low stretch also improves the sensitivity of the line. So, you will be aware of any bites and will be able to take instant action. Furthermore, the line has a very thin diameter which makes it totally invisible for the fishes. However, many found the line to be so thin that it made the line weak and break easily. You do not have to worry about the durability in other sectors though. The line is highly abrasion-resistant and you can use it in saltwater without any worries. Apparently, it is made from superior quality nylon imported from Japan so you can rest assured about the quality. ​​​​​​Low ductility makes the line resistant to debris. ​​​​​​The low stretch makes it more sensitive to bites. ​​​​​​Abrasion resistance makes it suitable for saltwater. ​​​​​​​The thin diameter decreases its visibility. ​​​​​​​Supports long and easy casts. ​​​​​​The line might actually be too thin and end up being so weak that it snaps. If you are on a budget and its low, this is a line that you can consider. Apparently, this is another Hurricane product so you can expect the same type of quality from it that means ‘good’ quality. Hurricane products are not one to disappoint you and will give you exactly what they promise you. So, this is a line that has a very thin diameter which gives you the advantage of low visibility. Furthermore, the color is somewhat transparent as well. Therefore, you can just ambush your prey without it guessing a thing. Then, this line is abrasion resistant, just what you need for saltwater fishing. If knots give you knots in your stomach, you have nothing more to worry about. Apparently. These have a great knot strength so your line won’t be breaking the moment you face a big fish but bringing you out victorious. In fact, you might end up with more than you expect with this line as it has a good tensile strength. It is neither the best nor the worst but you can consider it a good option for the price it comes at. ​​​​​​​A product of Hurricane reputation. ​​​​​​​Thin line with low visibility. ​​​​​​​​​Might be a bit hard to tie. Are you looking those rare instances where quality is better than the price? Well, this is a case where it is. Let us talk about the features later but the quality first. Apparently, the Paramount uses the latest technologies to provide you with the best performance and its consistency. It is abrasion resistant so no worries in saltwater. In fact, this line uses Nylon Multiplex material to create an ultra-thin diameter line. It helps you maintain low visibility while you feel less weight from holding the line for too long. You also get a number of sizes of this line to choose from. Moreover, forming knots with this line is quite easy. The knot strength, however, is not the best. Most negative reviews were about the line snapping at the point where the knots were made. Therefore, it’s best to avoid knots. But, if you want to enjoy quality, strength, and durability, this is the one. ​​​​​​​​Very high quality build and feel. ​​​​​​​​Looks superior in quality as well. ​​​​​​​​Thin diameter makes it less visible and lightweight. ​​​​​​​​​A few sizes for you to choose from. ​​​​​​​​​Resistant to abrasion so it is suitable for use in saltwater. ​​​​​​​​​​It forms knots way too easily. ​​​​​​​​​​Tends to break at knot points. The last one on our list is probably out of a lot of your budget. This is our most expensive pick but it offers as much as it costs. You get all the good features in this one great professional grade line. Firstly, it has been made and developed after many rigorous tests. So, yes, it is made of great quality material. However, that’s not the only thing that makes it best. Apparently, it is made thin as well. So, with a thin diameter, you can have better sensitivity, comfort and also low visibility. It is easy to use as well. You can tie knots super easily and also cast far and fast. It gives you the capability to handle up to 80 lbs. Therefore, there can be no questions about its strength and knot strength. You will feel great (and rich) when you hold this spool and easily control it. It is, however, available in only blue color and the color blue is not the best option for saltwater. However, the line itself is quite abrasion-resistant and can be used well in salt water unless the fish notices its color. ​​​​​​​​​​Ease of control and use. You have to know about and consider these factors whenever you are buying not just a monofilament line for saltwater but any other line to get the best value. This is more of a mental reminder. The first thing you have to do is determine what you are going to be actually doing with your fishing line. Yes, you are going to fish but where and what? This time we know that you are going to be fishing in saltwater but there are many species available there- species of many sizes and weights. So, decide what is the weight and size of the species you want to catch. In other words, first, know thyself and thy fish. Suppose you did not consider anything about the line and you are off to fishing in the saltwater. You should know that saltwater fishes are bigger and more aggressive than the freshwater ones are. Therefore, the moment you feel a nibble, you will see your line snapping before you even start a fight with the fish. Why would his happen? Obviously, because the strength of the line was much lower than the weight of the fish. Therefore, consider the strength of the line. The strength of the line basically means how much weight the line can handle without snapping and is usually measured in lbs. So, for fishing for a 50 lbs fish, you have to look for a line with the test weight of 50 lbs. However, it is better to have more strength than that of the fish. Because more strength won’t break your line, less of it will. One more thing you have to keep in mind is that the more the line can carry, the thicker and shorter it will be. Therefore, tasks like casting will become difficult for you. So, many anglers just buy lines with less strength and go easy when catching a fish so that the line does not break. It is up to you whether you want to bring the fish in easily or need to be able to cast easily. Depending on your skill level, decide which act best suits you. Apparently, there are two basic kinds of monofilament lines. One is the floating and the other sinking. You can probably guess from the name what each of these lines does. In fact, the floating line floats on water and is good for catching top-water species while the sinking one sinks to catch the underwater ones. Apparently, the floating line cannot absorb water that’s why it keeps floating while the sinking one can. It is best if you do not swap the tasks of each and keep one of each with you. If you choose to keep one, decide first which kind of fishing you do most and keep the line required for that. Monofilament lines are mostly made of nylon and a few are made of an allow of nylon. In fact, nylon has been the traditional material for monofilaments for ages. Therefore, even if you find monofilament lines of new materials available, it is best to choose nylon unless you know what the other material is good for. For example, nylon lines are kind of slippery which makes it easy to handle. Moreover, you can tie knots in it very easily. So, for now, nylon is the best material for monofilament lines when considered in terms of ease of use. You already know that with a thicker diameter, you find casting more and more difficult. The good news is that you do not always need a thick diameter. It completely depends on the species you are after which size of the diameter you need. Line diameters usually range from 0.15mm to 1.5 mm. If your fish is large with a large mouth, you might go for thicker diameters. But, for medium and smaller fishes you should not even consider a thick line. Because thick lines are more visible in the water and they are also heavier and harder to cast. Yes, apparently, this is a factor to consider for lines but not for decoration or soul soothing. You may already know that fishes can see colors. Therefore, it is necessary that you do not expose your line to them. In fact, monofilament lines usually come in various colors. You have to choose the color based on the type of water you will be fishing in. Since you will be fishing in saltwater, it will best for you to choose either a transparent line or a red one. Basically transparent lines are suggested for monofilament lines and it has been proved that saltwater absorbs the color red and makes the line look transparent. 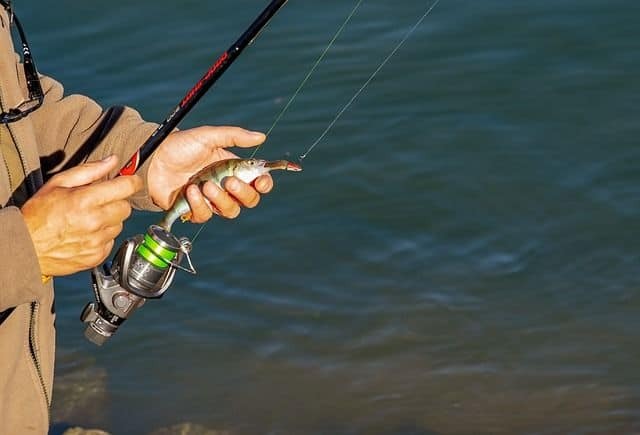 Apart from that, you should select light colors if you are spinning, casting or bottom bouncing and dark colors when you fish in murky waters. It would be a shame if your prey came, ate and left and your line provided no signal at all. The best line should be highly sensitive to even the slightest nibbles. All monofilament lines stretch. However, the less they stretch the more sensible they are. So, if you want to feel the lightest touches and be aware then find a line that does not stretch much. The greatest thing about monofilament lines is their price. They are notably inexpensive and quite available. Therefore, the price won’t be much of a factor. However, the durability might affect the price that you see fit. Lines do not really last very long. What you should keep in mind is that it should not last too short. You will definitely have to replace it but it should give you a good performance while you use it for its whole lifetime. Apparently, you might have to replace lines every six months. So, the low cost is a beneficial factor in this case. Monofilament lines are apparently the most inexpensive lines available in the market. As you know that lines do not last long so the low price really benefits you when you have to buy lines every few months. Apparently, you will find using the monofilament lines very easy and simple. These lines generally stretch a lot. Therefore, you will find tying knots as easy as a breeze. Furthermore, nylon lines are quite slippery and this will also help you handle it easily. Thanks to its stretching capability, monofilament lines do not snap easily at knot points. Fishes won’t really lose their lives so easily. Some might attack the lines and most will restrain it. Therefore, it is necessary that your line has the strength to absorb these shocks. And, the monofilament lines are very good at absorbing shocks thanks to their stretching power again. ​Monofilament lines are available in many different colors that do not just make them look nice but also contributes to making them more efficient. Using the correct colors for the right kind of fishing will increase productivity. You will be able to handle the big guys well with these lines. With their strength, stretch and other features, these lines provide you with a good combo for catching fishes easily. Specifically, since saltwater fishes are stronger and more powerful, monofilament lines with their greater strength handle them better. Q. Are Fluorocarbon-Coated Lines Better Than Just Nylon Lines? Answer: When you coat something with another thing, there is always some added benefit. Nylon, in general, has a few problems. It absorbs water when it soaks in it for too long. This decreases its efficiency. When it is coated with fluorocarbon, the fluorocarbon makes the nylon waterproof. So, nylon stops absorbing water and stays durable and efficient. Moreover, it also softens the line for higher sensibility. You see, there are so many small factors about the lines that can cause havoc in your fishing results. In fact, you might have been fishing with the wrong line for years and did not know what was wrong with it until you saw someone else catch more fishes than you ever did. Therefore, consider all these factors and see if you have a wrong specification for the line you need. Correct what you need first and then look for the line. If you keep each of these factors in mind, not even a fraud can stop you from getting your hands on the best monofilament fishing line for saltwater.